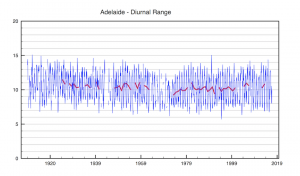 ← Warming in Australia occurs mostly inland and at night. 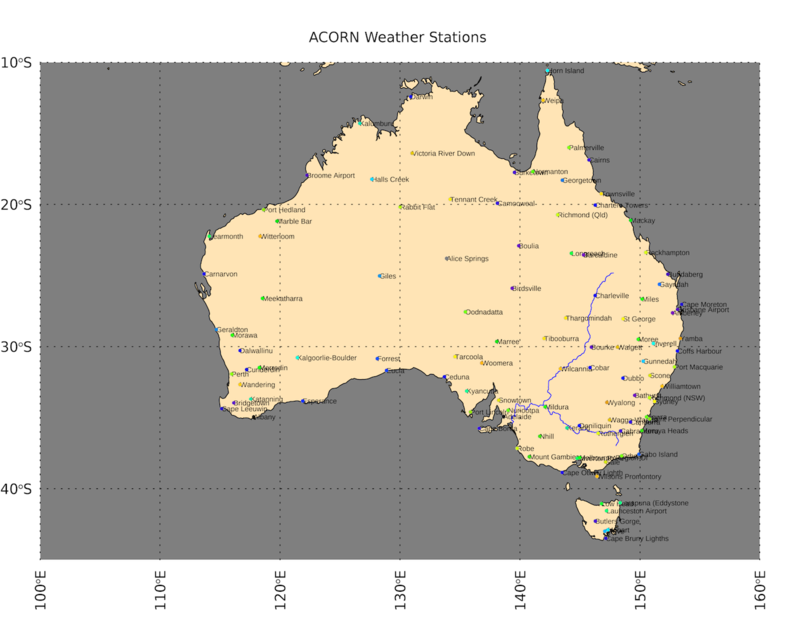 The Australian Climate Observations Reference Network (ACORN) Surface Air Temperature (SAT) is BOM’s ‘homogenised’ temperatures from 112 stations around Australia. These consist of daily maximum and minimum temperatures at each station from 1910 to 2017. I downloaded all the data and then calculated the daily, monthly, and annual averages and temperature anomalies for each station relative to a 1961-1990 baseline. I then made an area weighted average of all stations to produce annual anomalies based on a Lat, Lon triangulation. The result is shown below and compared to GHCN V3C. 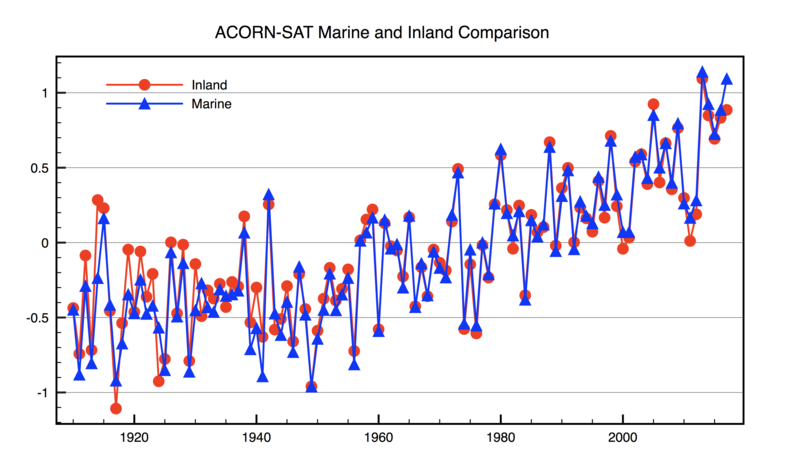 Comparison of ACORN-SAT and GHCNV3C annual anomalies. The result agrees almost exactly with GHCNV3C for their Australian stations. I therefore suspect that the station ‘homogenisation’ calculations are the same. The real surprise for me though was that the locations of the 112 stations are totally different to those from the hourly data described previously. Here are the ACORN stations. There are over 400 Australian stations contained in CRUTEM4 and GHCN but the extra stations seem to make very little difference. I repeated the same calculation first for coastal stations only, and then for inland stations. Here is the comparison between anomalies averaged over Inland stations compared to those averaged over Marine Stations. There is no difference. However, this result looks strange to me as I would have expected that stations on the coast would have followed more closely SST anomalies. 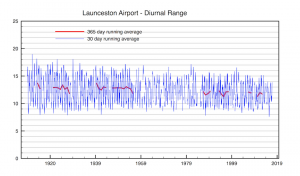 Even the off-shore stations based on islands and peninsulars show the same warming trends as everywhere else. Anomalies for 2 offshore stations. I have to admit that I find this a little bit strange, and it implies to me that the homogenisation has probably gone a little bit too far. This is how the averaged Marine station anomalies compare to the ocean temperature anomalies (HADSST3) in the Southern Hemisphere. The Marine stations appear to be warming about twice as fast as the surrounding ocean! ACORN-SAT provides just the daily minimum and maximum temperatures to work with. The diurnal range is then simply Max-Min for each day. 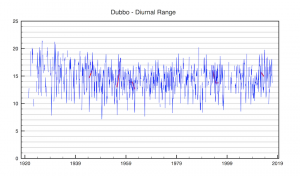 To reduce the daily variability I have taken a 30 day average, and a 365 day average. Missing data then leaves gaps in the traces. Here are some examples. 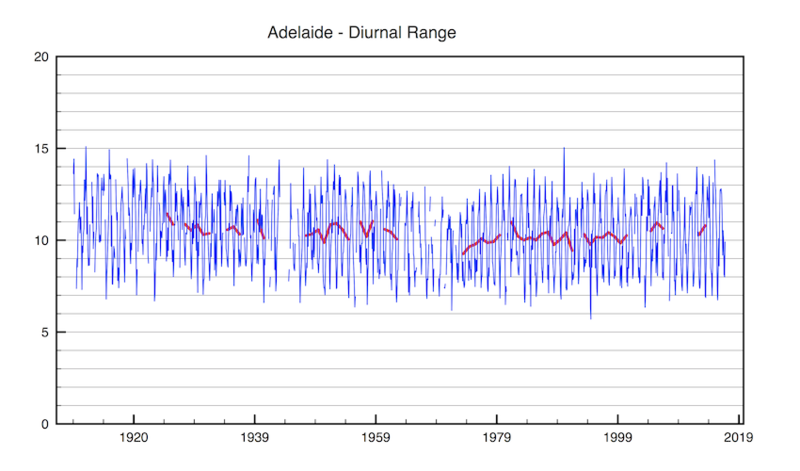 There is some evidence of a drop in Diurnal range, implying that minimum temperatures are rising slightly quicker than maximum temperatures. The UHI effect can also reduces diurnal range. However it is not a consistent story and several stations show no discernible trend. 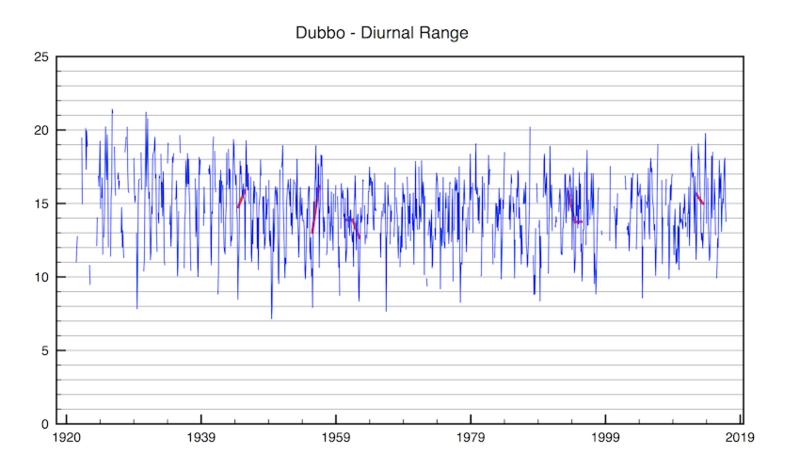 ACORN-SAT is the official BOM temperature series for climate change studies, and contains maximum and minimum daily temperatures from 112 stations. 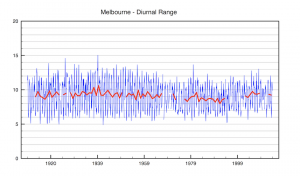 The data has been corrected for any apparent shifts in temperatures and ‘homogenised’ so that trends have been made consistent with near neighbours. The data show a net warming on land of about 1C since 1960. The trend is identical with that calculated from GHCNV3C which includes over 400 stations. There is no evidence of any difference in temperature response between Marine stations and inland stations. This is surprising because it implies that the coast is warming twice as fast as the surrounding ocean. There is some evidence that the diurnal temperature range is reducing although the effect is not as large as seen in the hourly data. 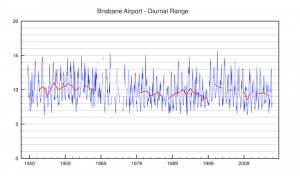 This entry was posted in AGW, Australia, Climate Change and tagged Climate Change. Bookmark the permalink. This lack of variation of land station warming rates from marine to inland seems to be global. Clive, I first noticed this a year or more ago after a rough check for a pattern in the station trends that you published. I checked for it on Nick Stokes’s interactive imaging tool last October and saw all the islands and coast lines standing out in contrast to SST. This definitely is worth more investigating. Some of this is surely because of land based temperature homogenisation simply because otherwise it makes no physical sense? By forcing all land based stations to agree with each other the algorithms boost offshore weather station anomalies. 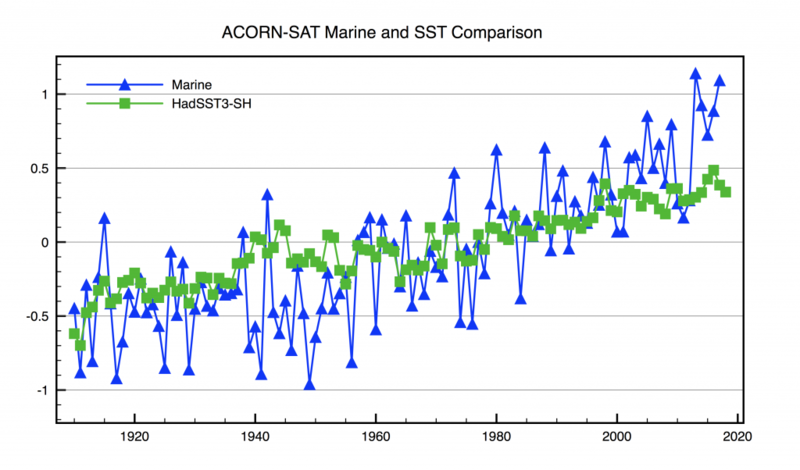 A lighthouse sitting in the ocean must follow SST, but that slow trend then triggers a correction through the pairwise logic with other stations inland. Pairwise logic would smooth the lighthouses with near coastal but it would have little affect far inland. So I wouldn’t think that is the entire explanation. But If it turns out that’s what it is then it may not affect the global average. If however it’s non-climate effects well that’s a whole different rat. 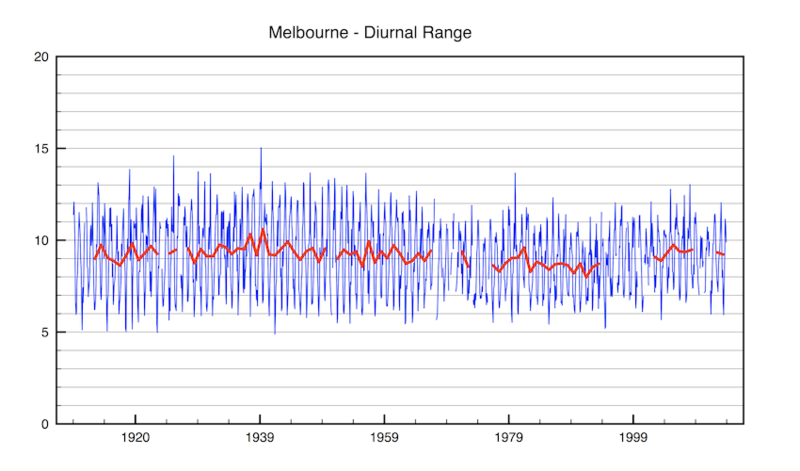 I thought it could be interesting to compare the official BoM temperature trend of Australia (based purely on ACORN-SAT I assume), with those of other major global datasets. 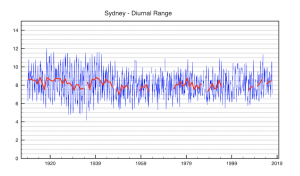 With KNMI climate explorer I calculated trends using land-masked data within 10S-45S, 110E-160E. The last three datasets have a crude 5×5 degree gridding. C&W may have some SST “contamination” in the edge cells. NOAA and CRUTEM have empty cells, especially in the early years, all other datasets are infilled and “complete”. 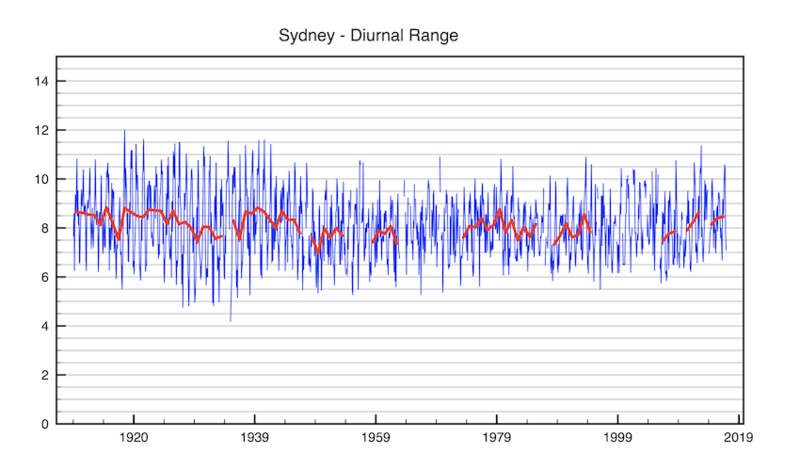 The reason they are the same is because BOM provide the data to all datasets. I showed that ACORN-SAT agreed with GHCNV3C. Homogenisation is essentially the same too. I am surprised about SST though!